Biology is the study of life and living organisms. This Science encompasses a wide range of domains including genetics, microbiology, taxonomy, biochemistry, physiology but also ethology and ecology. Studying A level Biology will give you a basic understanding into the way the body works, an overview of the impact of the expression of the genome and epigenome on metabolism, an insight into how cells communicate or molecules interact or the use of microorganisms in industry and ecology. This will draw link between different domains of Biology and other scientific fields and also provide an opportunity to think of the area you are potentially more attracted to and would like to study further at University. A level Biology can lead to many different careers. You can chose to study further and go into research, work in a laboratory or travel the world, studying different organisms or ecological phenomena. You can decide to go into scientific writing, or become a sales representative for a pharmaceutical company. Previous St Charles students chose to become radiologists, nurses, physiotherapists, veterinary surgeons or garden curators. This very wide range of choice of careers means it is strongly advised to get work experience in different environments to get a better idea of the career that is right for you. All papers will include elements of Module 1. The A level exams are all synoptic and involve the drawing together of knowledge, understanding and skills learned in the different parts of the course, including AS. The Practical endorsement will be graded: Pass or Fail. Lessons consist of formal teaching, questions, discussions, seminars on topics of particular interest and practical work, which is done individually or in small groups. Students will also go on field trips to complete the biodiversity and ecosystem part of the course. Students are given a booklet to complete and learn from per module and homework is set every week. Tests are also set on a regular basis, with bigger end of module tests. Workshops in the Biology labs provide the opportunity for individual study and consultation with staff. A variety of study aids are available in these sessions to improve understanding and exam performance. There will be particular emphasis on synoptic understanding in the second year of the course. 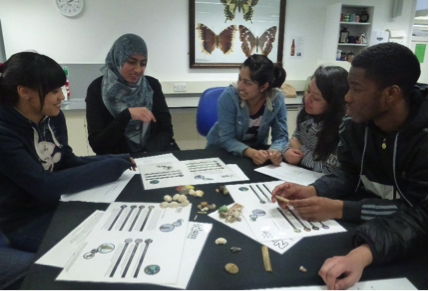 Students need to be keen and interested in Biology. Students choosing Biology need to have good Maths basics and are strongly advised to study Chemistry as well. Homework is set regularly and students are expected to spend at least 5 hours per week on Biology outside lesson time. Students are strongly recommended to read the scientific magazines available from the library in their study periods. Attendance at various extra-curricular lectures, universities open days and trips is encouraged to broaden knowledge and help with career choices. Miss Roquain is the main Biology teacher at St Charles College. She has studied Biochemistry and Cellular Physiology at Degree level. Miss Roquain conducted research on Alzheimer’s disease whilst completing a masters’ degree in Pharmacology of Aging and one in drug design. Miss Roquain has been working at St Charles College as a full time teacher since 2007. “It is interesting to see how a very small mutation in the DNA sequence can lead to such serious conditions"
The Biology department is part of the Society of Biology. We receive offers for scientific competitions, conferences and A level revision days. Students have the opportunity to take part in field trips and workshops to debate ideas and actively put their knowledge into practice.